I have found a layer cake I had thought was lost.only problem is I used everything that went with it and I need ideas . The layer cake is pale gray/blue very Parisian . What colour would you put with it and a pattern. Thought of MSQC new pattern or the star one. I just love a challenge something differen. I'm trying to use up my stash as it has spread all over the cottage and needs containing. Thank you in advance of help. a pale yellow and a cream? Hard to say with out seeing. Debra I agree but the picture was no where near the colour. find the PDF from United Notions. Thanks easyPeezy I have managed it. But I could only find charm pack. Looks like it is has a lot of pretty colors in it, red, browns, ect. It does have reds and grays and teals - very pretty!! Just hold colors like those up to your layer cake pieces. If you like it sew it up. MSQC has a layer cake pattern where you cut the 10" pieces thru the center so you have two stacks that are 5" x 10". Take the top piece from one stack and put it on the bottom, then sew the two pieces back together. Once all the blocks are sewn back together, turn the blocks 1/4 turn and cut again, this time off center, maybe at 7". Once again, take the top piece from one stack and put it on the bottom, then sew the two pieces back together. If you start with 40 - 10" squares, you will end up with 40 blocks. 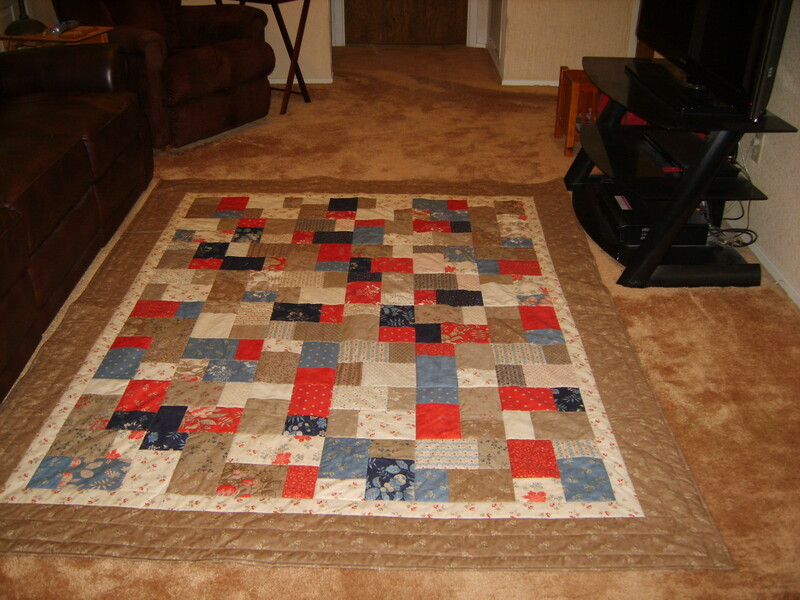 You can just sew the blocks together and make a scrappy looking quilt or you can sash the blocks using yardage. I made a couple baby quilts from one layer cake and it went very quickly. mckwilter, Thanks for the pattern from MSQC. I printed it out, looks like something I'd like to do sometimes. Kerry, check out the MSQC YouTubes, which is where I found it. And they have several others that use layer cakes. 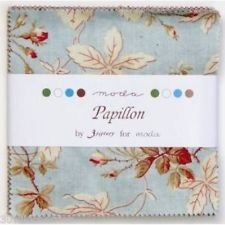 Papillon is a reasonably recent Moda fabric. I think it is by 3 sisters. Their lines often blend with each other. If you can't find Papillon, or something else you are happy with, look at newer lines by 3 sisters. Are you wanting border fabric? I just finished one of these. Let me see if I can find a picture. It was quick and I am very happy with the results. It is called the Two Slice Layer Cake. You may have to go back through the other videos to get it, but it is at the Missouri Star Quilt Company....if it interests you. It may not be challenging enough for you.